The 2019 Spring Commencement ceremony for master and doctoral degree candidates from all colleges will be held Friday, April 26, 2019, at the Screaming Eagles Arena at 6:30 p.m. on the USI campus. 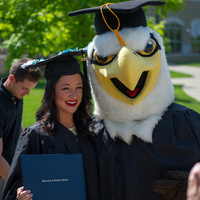 The 2019 Spring Commencement ceremony for undergraduate students will take place during four ceremonies held Saturday, April 27, 2019, at the Screaming Eagles Arena on the USI campus. At the conclusion of each fall and spring ceremony, graduates will be led out of the Screaming Eagles Arena to University Center East where a graduation reception will be held for the graduates, their guests and USI faculty/staff. Visit the Commencement website for ceremony information, streaming video and merchandise.